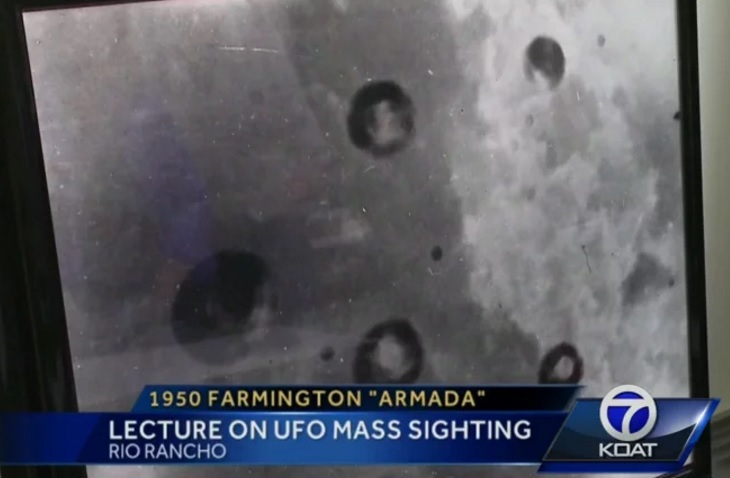 The Farmington Armada incident got a lot of local press at the time, but it took 65 years before there was in-depth research into the northwest New Mexico phenomenon. David Marler said his presentation Saturday for the New Mexico Chapter of the Mutual UFO Network is the first public lecture about a detailed investigation of the incident. Marler went in search of witnesses but discovered most of them are no longer living. However, he found a few, including 73-year-old Virgil Jerry Riggs. Riggs lives in Wyoming now and made the trip to Rio Rancho to be a part of Marler's presentation. He said it means a lot to him that the researcher is preserving the history of what happened in 1950. "I'm sure there are skeptics out there. I'm sorry about the skeptics. All I can tell you is what I saw, what I observed," Riggs said. He was 8 years old and a student at Aztec Elementary School in 1950. Riggs said he went outside for recess and thought there were stars in the sky, but middle and high school students pointed out the objects way up above. "All these square-looking formations in the sky. They were made up of dots, and the dots would shift from one formation to another," he said. "The first day there were a few, the second day there were too many to count and the third day, there were maybe 30 or 40 of them left." Riggs said they were high in the sky and people had to look hard to see them. He said one of the teachers cried, but that the children were not afraid as the objects in the sky did not present any threat. "I was really disappointed when they went away. A bunch of kids (thought), 'Now what do we have to do? Go play on the slide?'" he said. Marler is not new to UFO research. He said people should be skeptical about the subject. However, he said taking time to look at the data and documentation from the 1950s show there is something there. Marler said the official government explanation was that a high-altitude naval research balloon exploded, and people saw floating pieces of plastic in the sky. But he said that simply just doesn't match up with what happened. "They make it sound in their explanation like this incident only happened over one day in Farmington, when the balloon supposedly ruptured, but the two previous days we had numerous witnesses to hundreds of objects being seen, not only in Farmington, but in Tucumcari, Las Vegas, New Mexico, Albuquerque," Marler said. "Eyewitnesses at Kirland Air Force Base in the government's own documents talk about this. I could appreciate or accept the balloon theory if it was only one day, but how does it explain two to three different days worth of sightings?" Riggs is a retired commercial pilot who served in Vietnam and was a free fall parachutist. In all his time in the sky, he said he never saw unusual objects like he observed over Farmington when he was a child. He said a man walked up to him and several friends on the playground during one of the three days of sightings and told them to never forget. "You take a good hard look at it and you remember it, because you may not ever see anything like this in your life again," Riggs said. "And he was right." Could German UFO files finally reveal whether aliens have visited Earth?